Be on the look out for myrtle. No, I'm not talking about a person here, but the flower. It's a low growing plant that was used years ago as ground cover by many homeowners. 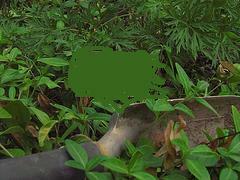 The plant is green and has a clover like leaf that grows about 3 or 4 inches from the ground. It grows and spreads quickly and is one of the reasons why it was used as ground cover. The plant is hearty and it continues to survive and spread throughout the years. If you see this type of vegetation along with a maple tree, you are likely to find an old homestead close by. I mention myrtle throughout my metal detecting TV series. Always look for the plant myrtle and also watch for old maple trees. Weather they are still standing, or if they have toppled over and lay rotting on the ground make no difference. When driving on State lands that have been reforested by the CCC’s pay close attention for any of these old maple trees. Civilian Conservation Corp As mentioned before, during the late 1920’s and early 1930’s after the States had taken possession of private properties, the CCC’s reforested these areas. They planted thousands of acres of pine trees. Today, as you drive the older roads on State lands you’ll notice mile after mile of pine trees. Important…If you’re observant, everyone once in a while you’ll notice a very old, large maple tree standing tall in the midst of the pines. Usually the maple tree will be standing along the edge of the old road. That maple tree is a sign that long ago someone had planted that tree, and the myrtle. Maple syrup was a staple of the pioneers diet. So the old maple tree is an indication that a cellar hole is in the area. So if you notice an old maple tree that suddenly appears among those pines, it’s a good time to get out of your vehicle and search the immediate area. Look for a cellar hole. However, as I mentioned earlier, it’s not always easy to see the cellar holes or ghost towns. There are a variety of reasons why. The vegetation may be too thick for you to walk through. Many times the thick vegetation has grown over the cellar hole hiding it from view. Also, many times the CCC’s back filled the holes when they reforested the area. Often times the county has backfilled the cellar holes to clear an area for hunters to park their vehicles. This is why it is important to look for as many signs as you can that a homestead was once in the area. If the cellar hole is not visible, then you need to look for more signs that a homestead once existed there. Watch for small pieces of pottery lying on the ground. These bits of pottery shards are a reminder that a home or ghost town was at one time in the area. The pottery shards may have broken off when the pottery was discarded by the users. Many times, pottery that was no longer useful was thrown into the privies or a backyard junk pit. Every older home had a place outdoors that was used for items that were no longer useful to the inhabitants. Old bottles, footwear, pottery, even jewelry and many more items were often tossed away. If you notice any of these older and colorful pieces of pottery lying on the ground, then it’s a good indication that a ghost town is nearby. Another clue that may lead you to a ghost town are old apple trees. Apples, like maple syrup, were an important part of the pioneers diet. Most homes had at least a few apple trees planted near by. Important Be especially careful when walking in thick vegetation in the area of ghost towns. Open wells that furnished the homes with water are often covered with vegetation. It’s easy to fall into one. The thick summer vegetation in the East and the Midwest sometimes grows over the top of these open wells, hiding them. Always pay attention to where you’re stepping. Try to clear away any brush in front of you before you take the next step. Sometime I carry a walking stick to clear an area in front of me. Many of the wells are only about two feet in diameter, but wide enough to hurt anyone that falls or steps into one. I've seen myrtle so thick it had entirley coverd old wells. While filming a segment of my TV series Ghost Towns Of The East TV Series - Watch A Brief Video Trailer I came very close to falling into an open well. That particular well was located in a ghost town on private property. The property owner was not even aware that a ghost town, let alone an open well, was on his property. Most of the old homesteads were built on high ground because of the problems with flooding. In addition, because the occupants needed a constant supply of water, the homes were built near small creeks and riverbeds. So pay close attention to any high grounds that have maple trees, myrtle, and apple trees. Also watch for old stone fence lines. They were used as borders around the old properties. The stone fences are two to three feet high. You have probably seen them many times as you drive the countryside. They were built with flat or slightly rounded large stones. Their purpose was to contain farm animals as well as to mark the property lines. I’m amazed when I think about how long and difficult a job it must have been to build these stone fences. The stones not only had to be dug, but also carried to the area where they were laid into place. Some of these stone fences often took years of hard work…and many of them continue for miles. While driving, if you notice a stone fence, be aware that there may be a cellar hole or a ghost town nearby. Myrtle, maple trees and pottery shards will lead you to ghost towns in the east. If you are not familiar with my TV series and DVD Ghost Towns Of The East please visit here. Be sure to watch the video trailer.